Richard Giles, astrologer and feng shui expert, reminds us that the Flying Star numbers change each year and that in order to maintain the best and most prosperous living environment, we need to adjust it to maximise the beneficial chi and minimise the antagonistic chi. The best way to do this is to have a consultation with a practitioner in your neighbourhood, but here are a few pointers, according to the energies of the coming Year of the Tiger. In traditional Feng Shui assessments there are flying numbers, called Flying Stars, that arrive in different sectors of the house each year to influence a building's good and bad fortune. In the Year of the Tiger, the Flying Star numbers that create challenges in your home will move on to new locations (see my 2009 Chinese Forecast). There are prosperous energies—and the illness and breakdown energies. The good fortune numbers are 8 and 9, and the sickness numbers are 5 and 2. The two most consequential are the number 5, called the Yellow Five, and the number 8, called the White Star. These new numbers move into place on the 4th February each year, the beginning of the solar year, and it's always good to have your remedies in place in the last weeks of January, as their influence begins to grow from then on. These yearly prosperous numbers bring a fortunate effect for your house if they fall into the front door, the office or your bedroom, and the illness numbers can bring health problems for you. It's advantageous to consult a Feng Shui practitioner to find out exactly where these energies are going to be this year and what impact they'll have on the resident Flying Stars in your own home. What I have written here is a good beginning guide. In February 2004 the centre cycle number, found in the middle of every new building, moved to the Age of Eight energy. Number 8 is now a key to your success in the thirteen years remaining to the end of 2023. The Number 9 rules the following twenty year cycle from 2024-2043, so its influence is also important. During 2010, the numbers 8 and 9 are found respectively in the Centre and the NorthWest of your house. With the number 8 in the Centre of your home, depending on the design of the building, its abundance may not always be able to be taken advantage of. If your office or main room is towards the Centre, then you can be blessed with an abundant flow of supportive energy this year. The Centre is ruled by the element Earth, which is about the practical and durable, stone, earth, bricks, storage and the land. To make it work for you, avoid any blocking energies in those two sectors. Give them a good sweep out and clean all windows and doors. Get rid of clutter. If it's appropriate, add flowing water to the NorthWest, but not the centre of the house. The NorthWest corner brings benefit and its about teachers, mentors, neighbours, creativity, leadership, management, administration and perseverance. And the father of the family this year will be fortunate in businesses to do with these areas. The numbers 5 and 2 fall respectively in the SouthWest and NorthEast of your house this year. If this area has the front door, bedroom or office, then take these precautions for 2010. The remedy for the number 5 is to hang a six piece metal wind chime somewhere in the SouthWest sector of the house (outside). 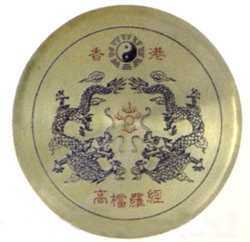 If you can't get hold of metal wind chimes, then find a metal bell or gong to hang. Best metals are copper, bronze or brass. Don't use bamboo, wood or glass chimes. Clear out any clutter and let the area breathe. The most difficult months for the 5 Star will be in May and August. If you have a SouthWest facing front door, then each month may have different issues. In February it supports wealth. In March it's food poisoning; in April it's headaches; in May we see a double 5, bringing sickness; in June it's breast health; in July, it's liver issues. In August it's sickness and struggle; in September it's ear disorders; in October it's depression; November it's supportive; December it's food problems; and January, it's headaches. Sounds awful doesn't it, but these are the weaker areas with the Yellow 5. It's an indication of weak organs. With strong Metal in place in the SouthWest, you can avoid all these. Ring your bells and strike your metal gong at the beginning of each month. 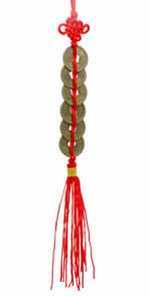 In the NorthEast of your house, hang a set of six coins tied together with red ribbon, or use the bell method. Colours to avoid in these sectors are reds and pinks, yellows and purples. Get rid of them for this year. If you have any moving objects in these sectors, especially flowing water, then move them away for this year. The unfortunate Flying Star 3 (called the Phantom of Misfortune) is a Star of conflict and robbery. This is in the South sector of the house. Put up a piece of strong red paper in the South to minimise it. Also the Flying Star 7 (called the Spirit of Solemnity) bringing scandals is in the SouthEast. The traditional way is to place a glass vase with a 3 piece bamboo plant in water in the SouthEast. The other precaution to take relates to the direction of the year's incoming energies from the zodiac animal of the year, the Tiger, from the NorthEast. It's called the 'Grand Duke' and is like a military man on a horse riding towards you. Don't challenge him by facing his direction, but face towards a better direction. If your office desk faces to the NorthEast turn it to another suitable position until the year is over. It's advisable not to do any renovations in the north-eastern part of your home for this year. They may bring problems, bad luck, or never be finished on time. For any more detailed information on house influences in 2010, find a qualified Feng Shui practitioner. You can contact me in Australia, or look up the lists in your local directory in the state or country where you live. Richard Giles is a Feng Shui practitioner and astrologer who is available in Australia for consultations on your home and business. He has been involved in astrology for 22 years and writes for several Australian magazines. He organises the 2 day Crystal Waters Astrology Conference each year in October. Click to contact Richard Giles.